Summary. 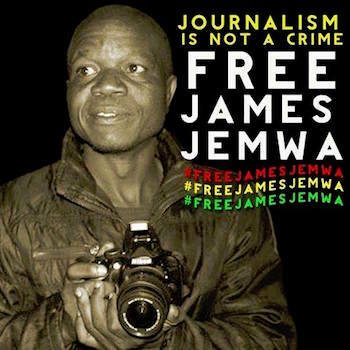 James Jemwa is a Zimbabwe cameraman and videographer who has been assaulted and jailed numerous times merely for reporting on peaceful demonstrations. He’s one of many journalists who have been arrested and jailed for days without being charged. Jemwa continues with his work, despite the risks to himself and his family. Profile. You’re a cameraman covering a peaceful demonstration in Harare, Zimbabwe, that is calling for the release of a political activist. Suddenly, you’re surrounded by thugs controlled by ZANU-PF, President Mugabe’s ruling party. They beat you up, steal your camera, and, rather than fleeing, move to the side. A little while later, the police arrive. You point out the thugs, but the police make no move toward them. Instead, they arrest you for “participating in an illegal demonstration.” Battered and bruised, you’re hauled off to the police station. This has happened more than once to James Jemwa. Sometimes he is released without charge; other times he stays in jail until he meets bail. Jemwa’s passion is highlighting abuses of human rights in order to help achieve democracy in his beleaguered Southern Africa country, which has known only one head of state since independence in 1980. “This hasn’t been an easy task” is quite the understatement. Jemwa, with a wife and three children, worries about not only his own safety but also that of his family. In the Harare incident, which occurred in August 2016, the thugs took Jemwa’s camera, phone, and press card, then beat him up, leaving him with a swollen face and injured hand. Jemwa was taken to jail and spent a week in detention on public violence charges; he was then released on bail and told to report to the police station every Friday. Eventually, the state failed to prove evidence of wrongdoing, and Jemwa was freed.